Today I went to Fred Segal in Santa Monica with the rest of LA's eco-conscious (or maybe just the fashion-obsessed). I was there for the limited edition bag by Anya Hindmarch. 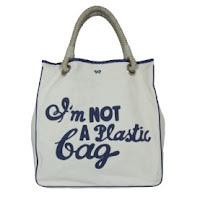 Written on this adorable tote are the words "I'm not a plastic bag." I arrived in line around 9am and was the 23rd person. (The first two girls in line had been there since 5am.) Many more filled the line behind me by the time the store opened at 10am. I had fun talking to some girls in line and walked proudly out of the store with my two bags. I will definately enjoy sporting my thought provoking bag and I hope that it will create conversations about sustainability with those around me. The other I will put on Ebay, so check out my Ebay Shop! There is some controversy surrounding the bag because it was produced in China and not made of organic materials, in order to make it affordable. My opinion is that sometimes you have to make tough choices, but you need to be realistic about what you want to accomplish. Anya may have only approached one aspect of sustainability, making it fashionable. According to the turnout today, I think she succeeded.